I must reflect on an experiment from last month's TotalCon that worked smashingly well (likely my favorite event of the con). My friend and co-Wandering DM Paul invited me to join him for his recurring Sunday-morning "Boss Fight for Breakfast", a two-hour all-out fight between players and some major D&D bad guy in an interesting lair with various environmental hazards. In this case he invited me to participate as something of a co-DM, namely, the dedicated brains behind the boss -- here, Flame, an ancient red dragon of maximum size, power, and spellcasting ability, from the Dungeon Magazine #1 adventure "Into the Fire". Specifically, my role was this guy. I was really thrilled by how this worked out. Sometimes with a single large bad guy there's a danger that PCs are going to swamp him with the "action economy" of getting lots of actions while the boss only gets one per round. 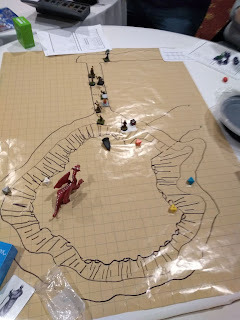 There were 9 high-level PCs coming at me with lots of spells, magic items, cold abilities, magic detecting swords, etc., etc. -- which I was not allowed to inspect before the game -- so I was worried this was a distinct possibility. Situation as PCs saw it at the start. But as it turned out I was really quite happy with how challenging I could make this. I used illusions layered on illusions on top of other illusions to distract the players. I hit them with two 88-point flame breaths while they were carefully trying to avoid a major trap. I got one player to run to their death into a hidden chasm. Another, flying on a magic carpet, conked their head on a cavern roof hidden by magic. I hit a batch of them with a hold spell (although all but one made their saves), and managed to drop a portcullis trap on them. I even taunted them into using the one spell against which I had an item giving me immunity. I was defeated in the last 5 minutes of the session, but I think I put up a fair game. Situation as everyone saw it at the end. When we left the convention, both Paul and I shared the same observation; neither of us could have made that game work the same way working alone. 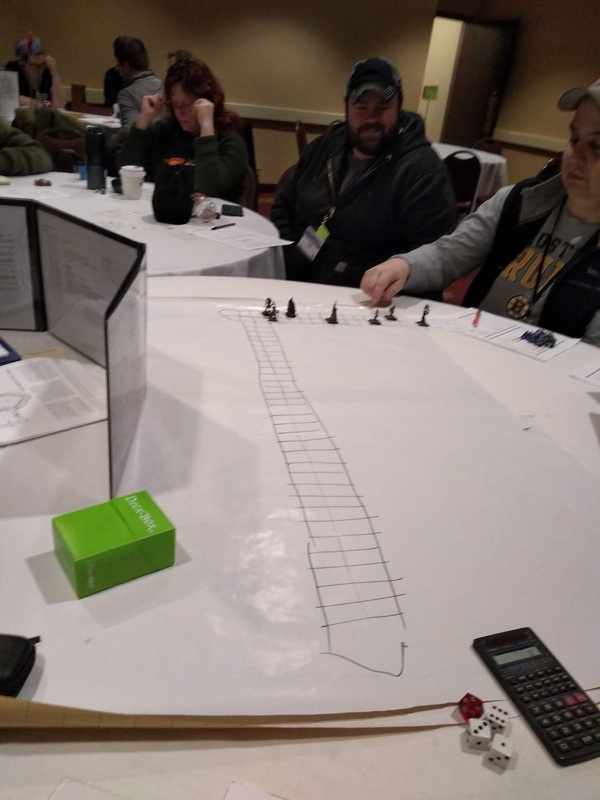 As referee, your hands are definitely full going around the table adjudicating (high-level) player actions, questions, details on spells, saving throws and damage, etc., etc. When it gets to the monster turn, I would feel compelled to take an action in 5 seconds or so -- the same as I permit players, to keep the action fast-paced -- regardless of whether it was a very well-considered move or not. But by separating the jobs here, Paul could focus on rulings on player actions, while I had the whole 10 minutes or so to meditate on my options, look at my big hand of spell cards, estimate distances, reflect on player actions, etc., and come up with the best and most devious response possible. In particular for these kinds of "genius-level" take-no-prisoners opponents, this approach definitely resulted in me running the most devastating boss monster that I've accomplished to date. 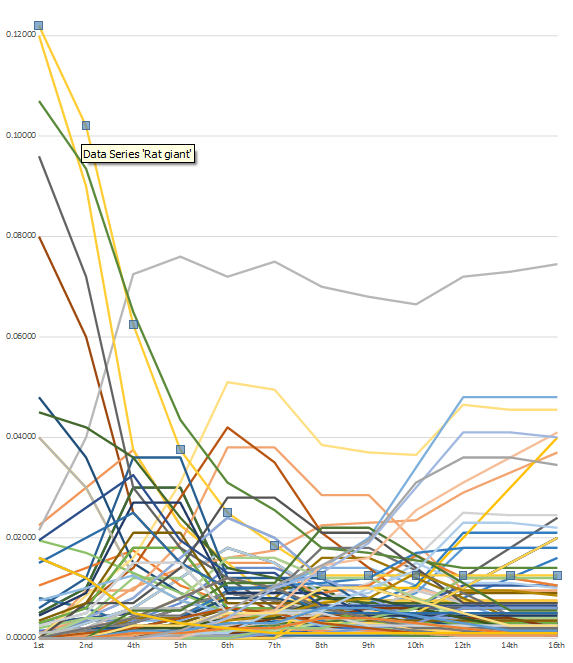 I think that may be generally true; simply put, getting 100 times more processing power is going to make your simulation look a whole lot smarter than normal. That may not be something feasible all the time (e.g., in a campaign game where combat is not happening all the time, there wouldn't always be something for the boss-actor to do), but in climactic set-pieces with mastermind spell-casters, now I might think this is the best possible thing to do, if I can find a co-DM for it. 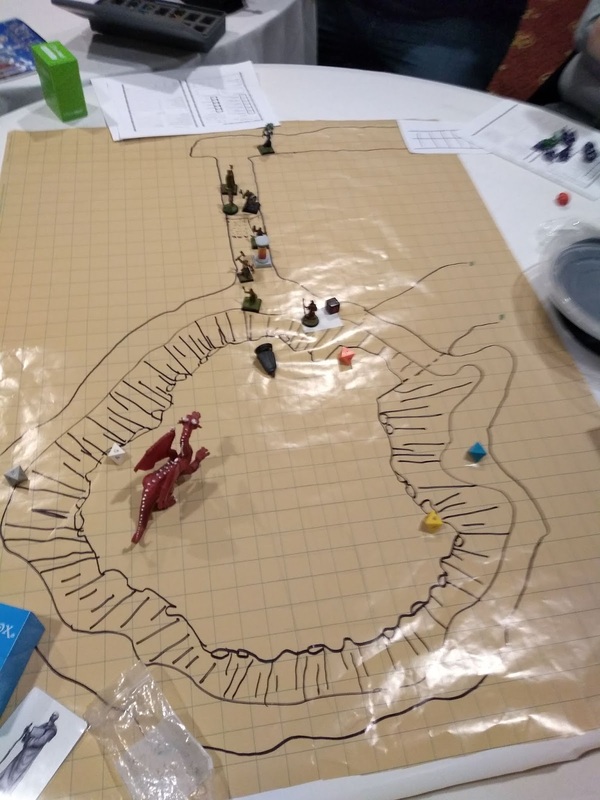 More: Our March 10th Wandering DM livecast was on the subject of Dragons, and lessons that we'd learned from the very game. Watch it here. I've spent a silly amount of time recently thinking about infravision. In particular: Should it be nullified when nearby to a torch or lantern? And what is the point of that rule in the first place? See, in OD&D by the book there is no such rule for infravision being spoiled near artificial light. It seems like a rule that Gygax came to between the OD&D and AD&D publications. It is on AD&D DMG p. 59. It was missing from the Holmes Basic draft manuscript, but was added for publication, presumably by Gygax (p. 10; see Zenopus Archives). We're told by Ernie Gygax that what Gary had in mind was specifically this scene from the original Westworld (1973). But it makes so little difference in-game that I've been ignoring that rule for a long time now. The DMG says, "It requires not less than two segments to accustom the eyes to infravision after use of normal vision" -- two segments being a small fraction of a round, so I'm not sure how that would ever make a difference in play. I suppose there's the range issue: infravision is 60', and torches as of AD&D light a 30' radius, so I suppose that cuts down the distance. But on the other hand, OD&D says that monsters are seen at 20-80' (Vol-3, p. 9), and AD&D likewise says "A light source limits the encounter distance to twice the normal vision radius of the source" (DMG, p. 62) (as well as real-life experiments supporting the same thing, here; login required) -- so it seems like effective visibility is back to at least 60', equal to PC infravision. Moreover: I'm pretty sure none of us play like the monsters are blinded by PCs with a torch as in that Westworld clip, right? 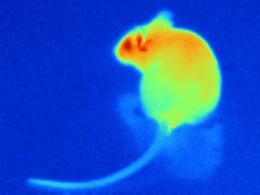 Snakes have specialized heat-sensing pits on their heads (2010). Mantis shrimp can see deep into ultraviolet and deep red wavelengths (2014). Zebrafish and bullfrogs produce special chemicals that can situationally shift their vision to near-infrared (2015). Then, most incredibly on the day that I wrote this post, a new piece of research broke: Researchers in China and at U. Mass injected nanoparticles into the eyes of mice, altering them to perceive near-infrared light -- and this might soon work for humans. Pretty amazing! The claim also is that this treatment leaves the standard visible-light perception unchanged. For all this, the burning question remains; if an infrared-sensitive creature stands near a hot torch or lantern, is its infrared visual capacity ruined? This does not seem to be a thing that anyone has tested to date. In fact, a few weeks ago I emailed one of the leading researchers in this area and asked, "If there is prey nearby and another very hot artificial source (say, fire), does the animal fail to detect the prey?". He kindly took the time to reply with: "Daniel, I don't know the answer to your question" (and also sent the inquiry to a second researcher). So: Still unknown as far as we can tell from current state-of-the-art science. But I still can't quite see what the point of that rule was in the first place, actually. Perhaps it's just a totally academic issue. Generally we've found in our analyses of Equivalent Hit Dice (EHD) power-ratings for OD&D monsters that the danger level is linear in hit dice (for example, see here or other "Monster Metrics" posts). We've taken this to support a linear system of XP awards per Hit Die (e.g., the original Vol-1 system of 100 XP/HD over the later graduated table from Sup-I and all later editions). Here's one notable exception: Hydras. As you can see in the chart below, Hydras are distinctly quadratic (parabolic) in their relation between HD and EHD. 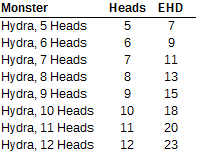 This isn't too surprising, because unlike other monsters Hydras are getting a double increase in attack potential per hit die (head): both adding to numbers of attacks, as well as increased chance to hit per attack (as by HD). In other words, they escape from the standard "action economy" limitation of most boss monsters, and wind up confronting PCs with staggering numbers of high-potential attacks per round. 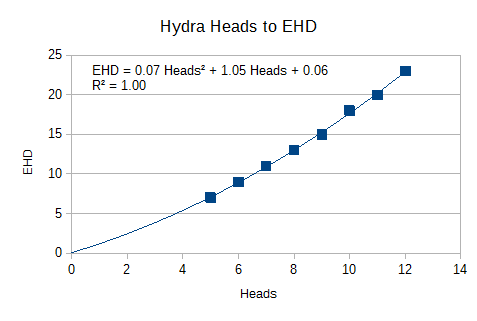 Alternatively, one could approximate Hydra EHD in the allowed ranged with a linear regression of EHD = 2.26 Heads − 4.73 (R² = 0.99), or whatever level to which you want to round that off. Tomorrow on the Wandering DMs Livecast: We plan to discuss issues around adjusting your game for Conventions versus Campaign play. Tune in Sunday at 1 PM EDT (UTC -4) and add your comments and questions to the chat! I recently re-read Poul Anderson's Three Hearts and Three Lions. 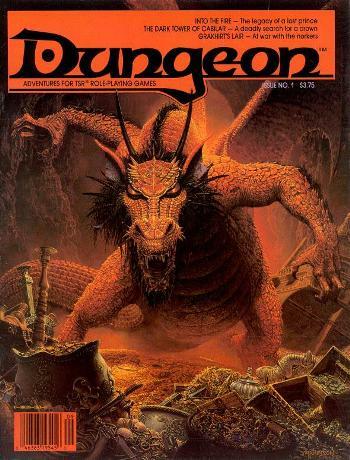 This is, of course, a critical piece of literature for D&D scholars (and other Appendix-N readers), granted how many ideas that were baked into the DNA of D&D originated here. Most of us are aware of the big-ticket items: Alignment (the cosmic system of Law-vs-Chaos; prior looks one, two), the paladin with a holy sword, a Scottish-speaking dwarf, and the swanmay (see also: mythological swan maidens). General emphasis on smells in sense-descriptions. Ch. 5, p. 46: Land permanently in twilight for Chaos types (e.g., goblins). Ch. 6-9: Lots of interesting faerie magic, customs here. Ch. 7: p. 57: Castle with magical moat, always circulating. Lord’s host sallies forth from castle (compare to Vol-3 castle behavior?). Ch. 8, p. 70: Doorknob turns to speaking mouth (magic mouth?) in castle of Faerie Duke, among many other enchantments. Ch. 10, p. 85: Supernatural enemies harmed by ultraviolet light. Ch. 12, p. 102: Law/chaos used interchangeably with good/evil (last line of big paragraph). Ch. 12, p. 107: Giants always carrying gold (and p. 113). Giants (“Great Folk”) sit in wintry halls for centuries practicing contests of skill, especially riddles. Ch. 12, p. 114: Giant (et. al.) turned to radioactive stone by sunlight. Ch. 13, p. 118: Iron passes through werewolf’s body without doing harm. Ch. 13, p. 119: Lycanthropy is generally inherited. May be bear, boar, wolf, “or whate’er the animal may be for the person”. Lycanthrope “Wounds knit upon instant” (from non-silver). Possible recessive-trait werewolf who turns only when chaos magic ebbs over the land. Ch. 14, p. 132: Iron hurts lycanthrope in human form. Ch. 15, p. 142: Description of enchanted Avalon, magical island drifting over sea. Ch. 15: p. 144: “Ever-filled purse” advertised on magician’s sign (as Bucknard’s everfull purse). See also Ch. 17, p. 162. Ch. 15, p. 145: Magician with diploma from magic university. Ch. 15, p. 146: Invisible (unseen) servant. Ch. 17, p. 160: Geas prevents spirits from assisting with divination. Ch. 19, p. 176: Nixie who tries to capture the protagonist. Ch. 19, p. 180: Undersea weed-house. Ch. 22, p. 217: Troll fights with dismembered hand, leg, jaw, ropy guts (!). Ch. 24, p. 230: Presence of Hell Horse (note 1941-1944 art journal in occupied Denmark called The Hell-Horse [Helhesten]; "hell horse" is a synonym for the nightmare as per MM p. 74). Edit: Mike Mornard helpfully confirmed on the OD&D Discussion board that the Vol-3 castle behaviors, as established by Gygax, were in fact inspired by the action in Three Hearts and Three Lions (as well as various Arthurian tales). See here. Now, I've sort of made my peace with this table for gems & jewelry; while rare (esp. at the lower-numbered levels), when present they come in batches and generally large values, so they sort of give some reasonably high value. (A bit like hockey or soccer: scoring is rare but each goal makes a big difference!) 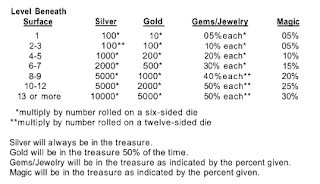 However, magic is very rare throughout dungeon levels 1-3, apparently only shows up one item at a time, and has the added limitation that when you turn to the magic tables, 25% of the time it turns into a treasure map, and not actually any magic. Let's compute. Say on a standard piece of graph paper you get around 40 rooms per levels (that's what I tend to get), and randomly stock the whole dungeon with this method. Then on the first 3 levels combined you'd expect (adding terms for both with-and-without monster cases): 3 levels × 40 rooms × (2/6 with monsters × 3/6 treasure + 4/6 without monsters × 1/6 treasure) × 5% = 120 × (1/6 + 1/9) × 5% = 120 × 0.277 × 0.05 = 1.66 positive results for magic items. Adjusting for the chance of maps, we get 1.66 × 0.75 = 1.25 actual magic items. So on average we may likely get just one single potion on all of levels 1-3 of the dungeon, and no other magic whatsoever. That could make it a bit hard to fight 4th-level monsters like lycanthropes, gargoyles, or wraiths, that start showing up on the [checks notes]... um, 1st level of the dungeon. As we've seen, on levels 1-3 we only expect about 1/3 of a magic item per level, so rounding to the nearest integer, this appears as zero (0) in the table above. 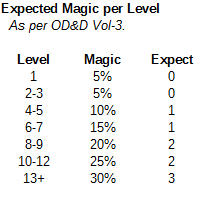 At other levels you may get 1, 2, or 3 magic items on average from the Vol-3 random method. If you make a dungeon of 12 levels (~500 rooms? ), then we'd expect a grand total of around 14 magic items in the whole complex. So I think that most of us would agree that simply can't stand; we have to do something else to supply fighters with magic arms and armor, wizards with wands and spell-scrolls, non-renewable potions of healing et. al., and other stuff. The most obvious way is by DM fiat, thinking of the "thoughtfully place" dictum. But then we are left with no other guidelines for what kind of distribution is recommended in that advance process. Perhaps one faint idea is to shift magic-positive results from one single item to 1d6 at a time (roughly tripling the numbers estimated above, on average). Any other ideas? Edit: Some folks in the comments take the interpretation that maps should not be generated from that dungeon-treasure table, actual magic only (maps for wilderness treasure only). There's definitely an intriguing case to be made there, but I'm not sure it's ironclad. On the other hand, if we do permit maps in dungeon hoards, then perhaps we should account for the magic items to which they can lead you. 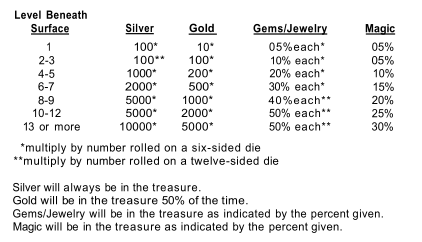 Random maps have a 30% chance of leading to a "Magic Map" table, and 10% to a "Magic & Treasure Table". Those are both d8-based, and coincidentally, they each have an expected production of 19/8 = 2.375 magic items (individual results go as high as 5 items!). So together any random map expects to lead to 0.40 × 2.375 = 0.95 magic item. We might as well round that to "1", which tells us that we can effectively just ignore the map discount itself (each map leads to an average of one magic anyway). Either way, we're then back to an expectation of 1.66 items in the first three levels of the dungeon (not a big difference). Or taking Daniel Wakefield's idea, maybe that gives us a clue for what a thoughtfully-placed "big magic cache" might be: 1-5 magic items or something like that. Other ideas are to scale it to the expected number of items PCs might have per level (almost embarrassed I didn't think of that earlier). Consider: These days I roughly assume that pre-generated PCs might have a 1-in-6 chance for magic per level in each of 3 categories. (So: a 6th-level fighter with +1 sword, shield, and armor seems reasonable.) That implies about 3/6 = 1/2 item per level. If one PC level correlates with one dungeon level, and we have 4 PCs, then it suggests we want 4 × 1/2 = 2 items per level (permanent items?). Compare that if we say that random magic finds include 1d6 items (similar to the 1-5 range in the maps), then that multiplies our earlier per-level expectation and get 0.553 × 3.5 = 1.94 ~ 2 items per level. So those figures seem synchronous. On the other hand, if you have big 8-person parties then you might consider the need to double that again? Geoffrey McKinney's stats for B2 indicate the per-area magic rate at about 80% × 50% × 46% = 0.184. So one of my 40-room levels would expect 40 × 0.184 = 7.36 items, or almost quadruple the figure in the prior paragraph. Hmmmm. 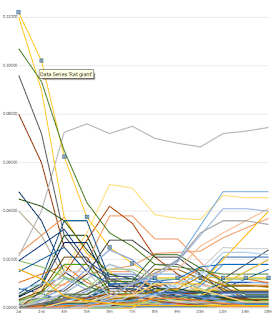 At least that gives us a starting upper/lower bound for what we might choose.